ParadeSmart's roots are in website design and development. We believe it's essential to have a fantastic website for your parade. Most HBAs create a separate website for their parade (apart from their HBA website). Going about designing and creating your site can be a daunting task. From our experience, below are nine elements your site needs to have. Creating a website that's easy to maintain and update is a must. For parades with dozens of homes, collecting, inputting home information into multiple sources (app, website, magazine) can be daunting and exhausting. Modern websites can be developed in such a way that they're database driven, off of the same data point. An offering such as ParadeSmart's can reduce your stress and save you many hours by having builders fill in the details of their home and automatically having that information appear in the app and the website (and by extension, use our master export feature to download all the information into convenient spreadsheets for your magazine company). choose a consistent theme for your parade magazine, website, and app. Use excellent photos -- the quality of the images can make or break your site's visual success. Keep the navigation menu clutter free and make the home page easy for the eyes to follow where visitors should go next to find the information they seek. Most of your visitors are looking for information right before the event and need information quickly. Nothing is more painful that needing to wait a long time when you feel like you're in a rush to get the information you need. Not only do people prefer fast loading websites, search engines do as well and is a good practice. There are a number of tricks you can do to speed up your site. A great tool developed by Google may give you a good start as to what you can optimize. Make sure you selecting a website designer that understands the need for fast websites as well. You're not going to want people visiting your parade homes before your event begins. Landscapers are busy planting grass, interior decorators and busy bringing in furniture, and the builder is busy working with the inspector. You don't want to make it too easy for your parade guests to find out exactly where all the homes are until the event is underway. Make sure your site has a way to easily turn off and on the map and location & driving directions to each of your homes. If you charge for entry into homes for your parade (or require a free ticket for tracking or sponsorship purposes), selling tickets online can be a big time saver (and money saver). Offering a convenient way for tickets to be purchased online should be part of the plan for your parade website. Take special care that your website's security is up to date and that your sites are secured with an SSL certificate to make sure sensitive information, such as credit cards, are transmitted securely to your website. Most parades ask their visitors to vote on their favorite home in a variety of categories. Collecting paper ballots at each home is doable, but difficult. If your website (and your parade app) has a built-in way to let ticket holders cast their vote, it will make counting votes and determining the winner much easier. ParadeSmart offers a people's choice voting system in their offering. It's a given these days that websites need to be mobile friendly. Mobile web browsing is dramatically more frequent for websites about a particular event, as people tend to look up information on the go. Be sure your website has a good mobile design that loads quickly. People like seeing homes in past year's parade for reference. It's useful for visitors to be able to find that builder or that subdivision that appealed them in past years. With all the effort that goes into putting on a parade and loading the content onto your site, you definitely want it to last a while. Have your site programmed in such a way your visitors can easily view previous year's parade homes on your site. Do you offer an electronic version of your parade magazine? Do you have a PDF of a map showing where homes are located? Be sure to include a Downloads section your site to make it easy for visitors to quickly find resources they'll want to print or take with them on their mobile device. Sponsors play a big role in making Parades happen. Don't leave them out. Offering website advertising space can be a big benefit to the sponsor (and your visitors). Most websites include logos of sponsors or banner ads on the website. There you have it! 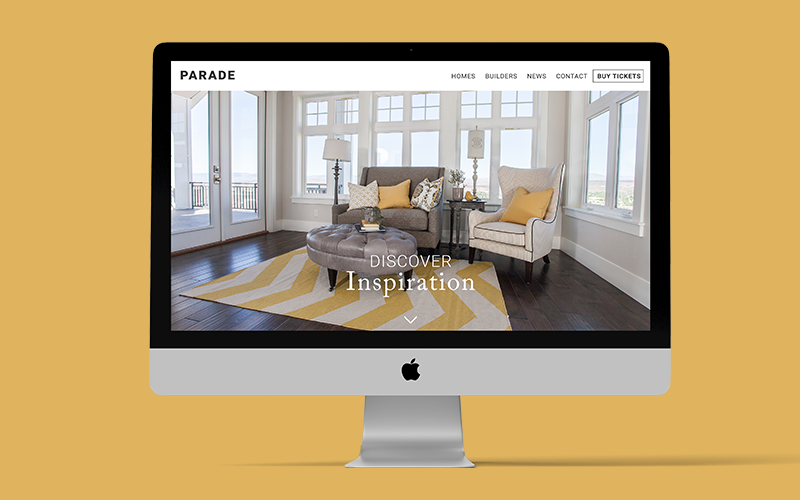 I hope you've enjoyed the 10 things to keep in mind when planning and executing your Parade of Homes website. ParadeSmart offers website design services along with the app design features. ParadeSmart's websites integrate with the rest of your system for a seamless, easy to manage experience. Contact us today about our web design services.